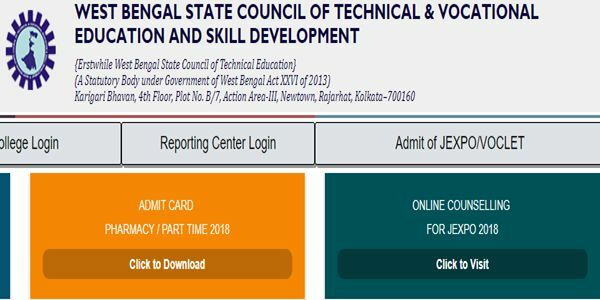 JEXPO/ VOCLET 3rd Phase Seat Allotment Results 2018: West Bengal State Council of Technical Education, Kolkata has scheduled the JEXPO Polytechnic 3rd round seat allotment results today, 9th july. Aspirants waiting for WB Polytechnic JEXPO 3rd round allotment can switch to WBSCTE official website, webscte.org or webscte.co.in. candidates can download the West Bengal Polytechnic seat allotment result from any of the websites mentioned above. Aspirants who allotted admission in the 3rd phase seat allotment will have to proceed with seat booking/locking, and fee payment phases. Candidates those who got the admission in 3rd round, last date for admission is 16th july. Aspirants cleared the JEXPO admission test with a good score will get admission in Polytechnic courses in their desired discipline and college. Candidates can get to know more details about JEXPO 3rd round seat allotment results from the following. West Bengal State Council of Technical Education, Kolkata annually conducts the Joint Entrance Examination for Polytechnic (JEXPO) examination for aspirants seeking admission in Polytechnic courses. WBSCTE will provide admissions for aspirants Vocational courses for the aspirants. The West Bengal State Council of Technical & Vocational Education & Skill Development was formed in the year of 2005 and the organization yearly offers admission to the aspirants into various courses Diploma/Polytechnic and others. Lakhs of candidates seeking to get admission in Polytechnic and Diploma courses will have to clear the JEXPO entrance test with good merit. Candidates cleared the test with a good score will get admission in WBSCTE VOCLET affiliated colleges. Candidates who had given the JEXPO admission test on 20th May and VOCLET examination on 27th May and cleared the examinations with a good score will get admission in Polytechnic/Diploma courses in the state of West Bengal. The WBSCTE has declared the JEXPO and VOCLET results on 1st June. And the 1st round seat allotment and choice filling process was carried out from 14th June to 21st June. All the qualified aspirants have applied to get admission during the scheduled dates. The JEXPO 1st round seat allotment result was announced on 21st June, while the Admission / Provision Seat Booking of 1st Phase has done between 23rd June to 28th June. Now, the WBSCTE is ready with the JEXPO 3rd phase allotment result. Candidates can check it from the official website, webscte.org. Check the 2nd, 3rd phase seat allotment and admission dates from the following table. On the homepage, the JEXPO Polytechnic allotment results 2018 [3rd round] link will appear. Click on the link and it will prompt you to enter the login id, password etc. Provide the necessary details and click on submit button. The WBSCTE JEXPO Polytechnic seat allotment results will be downloaded. Check the result and take a printout. When the institution will open for 1st yr session. I am not choice govt poly college.Have any options to share govt college.